Wisteria are the jewels of the botanic world; easy to look after, very long lived, vigorous, and simply magnificent when in flower. The usual Wisteria you find on front walls of English cottages is Wisteria sinensis, which must be 7-8yrs old before it will flower. Cultivars (ie; grafted, different colour Wisteria) can flower in their first year, but the older they are, the more likely they are to flower. Wisteria should be pruned twice a year to encourage flowering; once lightly in September, and again in February / early March just before flowering. We have limited availability of most of the cultivars. All our cultivars are grafted forms. Our specimen sized Wisteria Collection consists of FOUR very tall 9-10ft (inc. pot) Wisteria and will include at least two varieties of our choice, all four being deciduous. Supplied in 12litre size pots in their pots at the 9ft-10ft (inc. pot) size, shipped in two (very long!) parcels. A saving of £40.00 if bought individually. The photo shows some of the actual wisteria on offer (taken in July). A pure white wisteria with, strong growing, and ideal for combining with a blue or purple form. The photo shows some of our beautiful six year old 5ft standards with 18inch heads in 35litre sized pots. We have both the normal alba variety (in 5litre pot) but also the longissima alba (also know as Wisteria Shiro Noda) which has the much longer racemes (flowers) . ALL OUR WISTERIA ARE GRAFTED (will flower earlier than non-grafted varieties). Wisteria 'Amethyst Falls ' is a rarely available Wisteria cultivar, with an outstanding bloom of blue-violet flowers before the foliage in May and June. Very fragrant, and ideal as a climber to cover a pagoda or trellis - please note that this is a smaller growing variety so if you are looking to climb a house, then choose Burford, Prolific, or Alba. ALL OUR WISTERIA ARE GRAFTED (will flower earlier than non-grafted varieties). This is a rare Blue Sapphire Chinese sinensis wisteria. An introduction from New Zealand, it has fragrant, soft-violet flowers. Note that this is a true 'Blue Sapphire' Wisteria and not a 'Prolific' that is sometimes sold as Blue Sapphire. It is best grown as a climber, but can also be trained as a 'standard' or as a bonsai tree. ALL OUR WISTERIA ARE GRAFTED (will flower earlier than non-grafted varieties). The Wisteria BLACK DRAGON or Kokuru wisteria has beautiful 1-2ft cascading racememes of highly fragrant, spicely scented double dark purple flowers. Wisteria 'Black Dragon' is the darkest purple flowers of any Wisteria vine, and is my personal favourite Wisteria being strong growing, and very different from the common Wisteria sinensis. ALL OUR WISTERIA ARE GRAFTED (will flower earlier than non-grafted varieties). Wisteria 'Burford' was introduced to cultivation by John Treasure of Burford House, and is considered to be one of the most spectacular of all wisteria. Incredibly long racemes of deep lavender / pale blue flowers mid to late spring, with a possible second flush of flowers in late summer. ALL OUR WISTERIA ARE GRAFTED (will flower earlier than non-grafted varieties). A rarely available cultivar from New Zealand. Stunning lavender / lilac blue flowers. Early to mid season flowering, and has one of the strongest and sweet smelling scents of any Wisteria vine . Strong growing. We have 6ft specimens available in limited quantity in 5litre / 10litre pots and also large 5ft older specimen standards with 18inch heads.ALL OUR WISTERIA ARE GRAFTED (will flower earlier than non-grafted varieties). The unusual Domino variety of Japanese wisteria has short racemes of purple / cream flowers which have a yellow 'eye' giving its Domino name. It is early flowering, and very prolific, possibly the whole vine becoming bathed in flower. Distinctive flowers of mauve, darkish purple, and yellow. 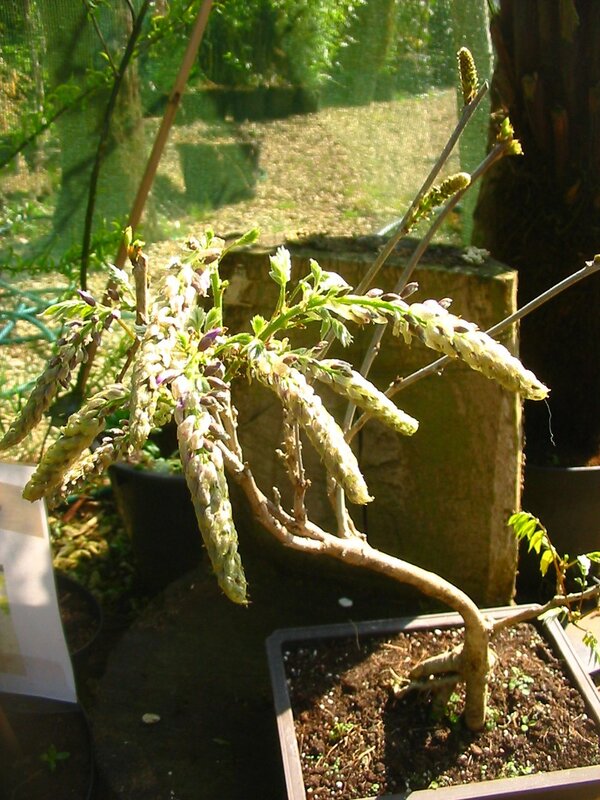 An unusual wisteria that may flower before the foliage appears in Spring. Strong growing. ALL OUR WISTERIA ARE GRAFTED (will flower earlier than non-grafted varieties). This is a rarely available Hichiren Japanese wisteria. It is a light lavender flowered wisteria, early to mid flowering season which will usually flower before the foliage appears. We have a limited number available this year and it is the first time we have had this variety for four years. ALL OUR WISTERIA ARE GRAFTED (will flower earlier than non-grafted varieties). A lovely pale blue/ mauve variety with medium growth and good flowering reliability. ALL OUR WISTERIA ARE GRAFTED (will flower earlier than non-grafted varieties). An uncommon variety, formosa Issai has beautiful lilac blue flowers, which are very fragrant. ALL OUR WISTERIA ARE GRAFTED (will flower earlier than non-grafted varieties). We are offering a limited number of STANDARDS this year. A rare variety of pale blue colour, with dense racemes which are fragrant. We have some larger specimens in limited quantity available now. ALL OUR WISTERIA ARE GRAFTED (will flower earlier than non-grafted varieties). A Japanese floribunda variety, which has beautiful & dense racemes of pale blue flowers, with a simply wonderful sweet scent. We have some older specimens in limited quantity this year. ALL OUR WISTERIA ARE GRAFTED (will flower earlier than non-grafted varieties). Wisteria floribunda lipstick is a distinctive wisteria with pale lavender flowers which are edged with pink (hence the 'lipstick' name) - a medium length flower usually seen in late Spring. 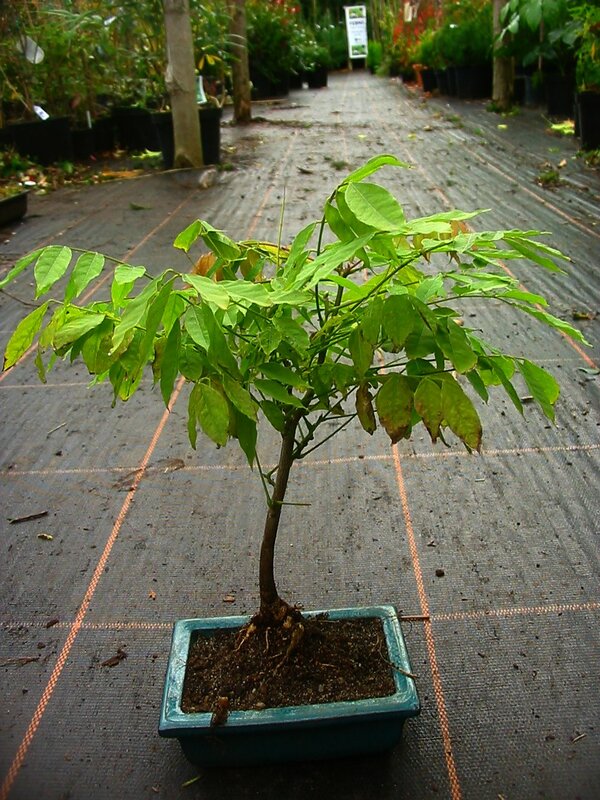 This is a rarely available Marasaki Naga Fuji / multijuga / macroboytrys, or Purple Rain Wisteria. A true miracle of nature, this Wisteria variety has the longest flower length of any Wisteria - in fact, it is in the Guinness book of records for having a flower raceme that was 1.8 METRES in length!! Flowers are light violet with a purple stain, lightly scented, and open up progressively in a downward direction starting from the top of the long, clustered bunches until finally reaching the bottom, and can be anything from a minimum of half a metre to over one and a half metres in length. ALL OUR WISTERIA ARE GRAFTED (will flower earlier than non-grafted varieties). A beautiful & delicate form of pink & cream flowers, with a simply wonderful sweet strong scent. ALL OUR WISTERIA ARE GRAFTED (will flower earlier than non-grafted varieties). Wisteria 'Prolific' is so named because of its huge number of flowers in Spring - beautiful hanging racemes of blue-violet up to 2-3ft long cover the plant from head to toe. 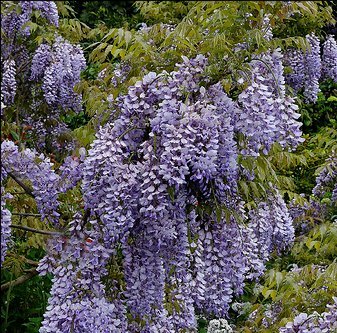 Wisteria Prolific is known for its reliability of flowering at a young age, as well as its very fragrant flowers, and makes an ideal pot specimen or house climber. The Rose Pink Japanese Wisteria, Wisteria 'Rosea' is a late flowering (May / June) wisteria , and becomes showered in spectacular rose pink racemes up to a foot in length. Fragrant, and truly one of the most beautiful of Japanese Wisterias available. ALL OUR WISTERIA ARE GRAFTED (will flower earlier than non-grafted varieties). A newer variety and not widely available at present, this beautiful hybrid has long racemes between 30cm-50cm and flowers are purple and fragrant. 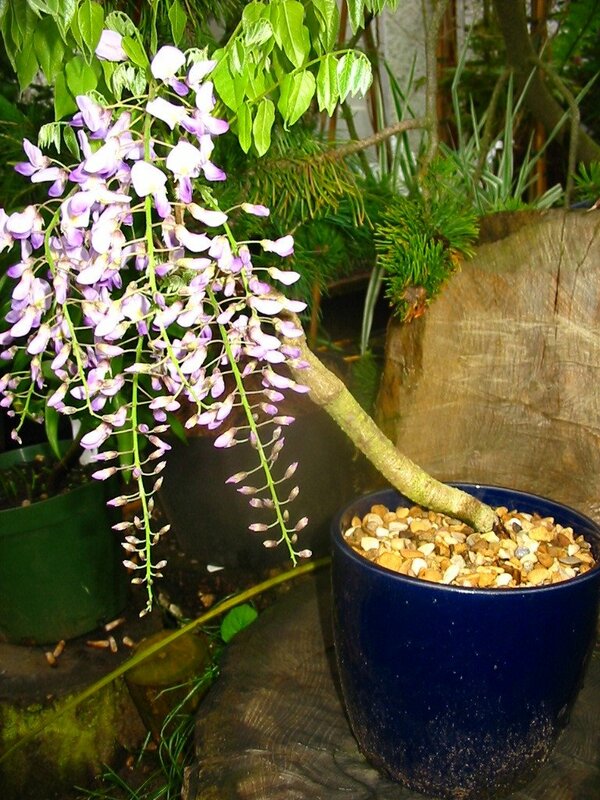 This is a rarely available Silk Wisteria or Shiro Kapitan wisteria. These wisterias are much sought after because they are the only species to have beautiful downy foliage, which is soft and furry to touch. They have a stunning cream-white flower which can be up to 1ft or more in length. It is best grown as a climber, but can also be trained as a 'standard' or as a bonsai tree. ALL OUR WISTERIA ARE GRAFTED (will flower earlier than non-grafted varieties). One of the best white wisterias, snow showers produces a prolific amount of pure white flowers of medium length. A strong growing, grafted hybrid. ALL OUR WISTERIA ARE GRAFTED (will flower earlier than non-grafted varieties). An unusual and very strong growing wisteria, with mauve/ blue flowers (racemes) with a yellow spot, which can be very long and this wisteria is very free flowering. ALL OUR WISTERIA ARE GRAFTED (will flower earlier than non-grafted varieties). Unique to our nursery, is our species and grafted wisteria bonsai trees. We produce our own trees, so each is different - the smallest are our young wisteria sinensis shown in the photo to the left, priced at £24.99 each. We also have a very limited number of grafted varieties which we train as bonsai, some examples of which are shown below: the first picture of Wisteria domino bonsai, and the second a Wisteria prolific in bud (click on pictures to enlarge). These two trees are now sold, however, we currently have available a very limited number of larger wisteria bonsai.